The demolition of Jannat-ul-Baqi on 8 Shawwal,1345AH(April 21,1925) at the hands of Al-e-Saud was a great tragedy in the history of Islam. 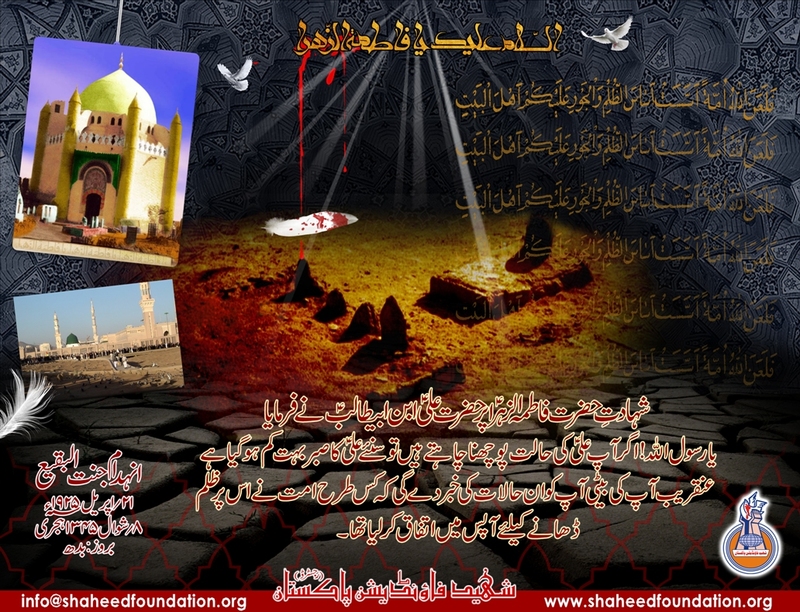 Jannat-ul-Baqi is simply a graveyard but Muslims all over the world attach it a high importance because it is situated in Madinat-ur-Rasool Where besides great companions of prophet Muhammad (p.b.u.h)his infallible progenies Imam Hasan Ibn Ali (2nd Imam), Imam Ali Ibn Al-Husayn (4th imam), Imam Muhammad Ibn Ali (5th imam), & Imam Ja`far Ibn Muhammad (6th imam), peace be upon them, are buried. In the same year (1925), King Saud bin Abdul Aziz also demolished the tombs of holy personages at Jannat al-Mualla (Makkah) where the Holy Prophet (s)`s mother, wife, grandfather and other ancestors are buried. According to some scholars what is happening in Hijaz is actually a conspiracy plotted by the Jews against Islam, under the guise of Tawheed. The idea to eradicate the Islamic legacy and heritage as well as to systematically remove all its vestiges was with the purpose to alienate Muslims from their history and pious personalities who have been torch-bearers to lead them to Right Path. Even today this devilish plan is being implemented through ISIL in Iraq and Syria. The world has already heard that the pious shrines of prophets Yunus and Shish,peace be up on them have been desecrated and then demolished by ISIL or so-called Daish .Thepious tombs of great companions of prophet Muhammed(p.b.u.h) such as Ammar bin Yasir and Hujar bin ODAI have been demolished by the notorious ISIL in Syria. This notorious group namely Daish which is the mercenary of Saudi Arabia, the number one lackey of USA and the Zionists in the region is intermittently attacking the the great shrine of Hazrat Zainab Salamullah aliha,the grand daughter of profet Muhammed (p.b.u.h) and the sister of the leader of the martyrs Imam Hussain (A.S).